Standing in one spot can give you an awesome view of both the East Arm and West Arm of beautiful Grand Traverse Bay. Me on O M Peninsula. West Travese Bay in the background. 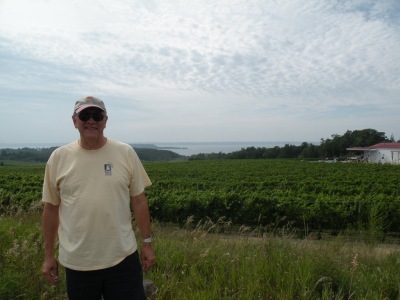 Old Mission Peninsula is a beautiful cape that runs 18 miles into Grand Traverse Bay. The peninsula is four miles wide at the widest point and defines the east and west arms of the bay. Unlike the Leelanau Peninsula you won't find any quaint beachtowns. Not to worry ... there is plenty to discover and enjoy here! Many have compared it to drives thru countrysides in Europe. The panoramic views of Grand Traverse Bay are absolutely breathtaking. Sue's favorite Traverse City coffee house. In Traverse City you'll turn off 31/72 north onto 37. 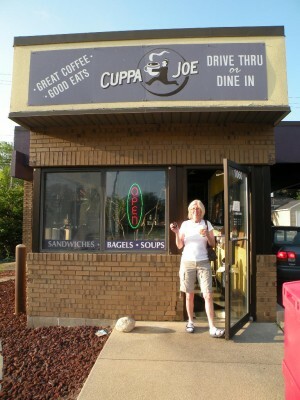 Now, on the sw corner of 31/72 and 35 is a little coffee shop (Cuppa Joe) that is a favorite of Sue's. Grab a cup and head up 37. 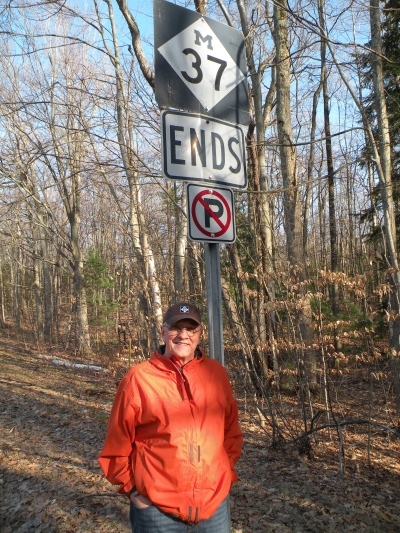 This (37) takes you right up the center of the peninsula ending at Old Mission State Park. You will want to check out the lighthouse (we always have to) and beach area. Penninsula Drive will take you up the west side of the peninsula and Smokey Rd. will run you up the east side. These are very scenic drives and take you closer to the shoreline and beach areas. 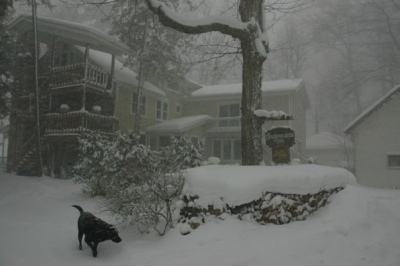 The Neahtawanta Inn ... beautiful northern Michigan winter. While driving north on Penninsula when you get near Bower's Harbor Take a left on Neahtawanta Rd. Follow the road around the bay and you'll arrive at Neahtawanta Inn. 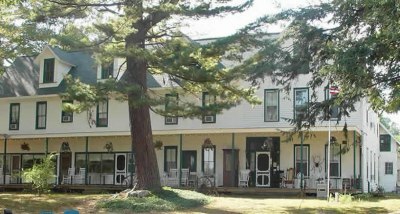 If you are looking for a "green" romantic getaway, organic foods, and yoga all in a turn of the century inn, this is it! Inn keeper Sally has created an ecological, sustainable and enchanting destination. Watch for Swaney Rd when your getting close to the Old Mission Park. Turn east (right if heading north) and you'll come to Old Mission village on Old Mission Harbor. There is a fun General store and you'll find the Old Mission Inn. This inn is Michigan's oldest operating hotel. Can you say ... charming? With Traverse City close you haves plenty of accomodation choices. The chain hotel/motels are close by as are the magnificent golf resorts. Moreplaces to stay in northern Michigan. We visited Chataeu Chantal Winery and were in awe of the view. You could see both arms of the bay, this made for simply stunning views. There are currently seven wineries on Old Mission and all are producing award winning wines. I guess it's the climate but the Reislings produced here are to die for. You know you"re at the tip of Old Mission when you see this sign. With so many micro-breweries springing up in the Traverse City area hops fields are becoming common sites. Sue and I have never seen hops growing and were surprised at the height of the plants, and how beautiful they were. It's easy to see Old Mission Peninsula is playing a big part in the wine and beer industries of Michigan. We get excited on our drives around Old Mission Peninsula. So many broad panoramic views, Europeon style wineries, and prehistoric beaches make this one of our must see's when we are near the area. From Old Mission Peninsula back to Grand Traverse Bay. 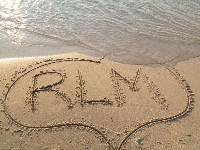 From Old Mission Peninsula to Romantic Lake Michigan home.